Flowers continue to shine forth in our tropical garden in spite of a more wet than usual month of July! These are some flower pictures taken of our gorgeous favorites and gathered together into a collage, to display an explosion of colors to delight in! 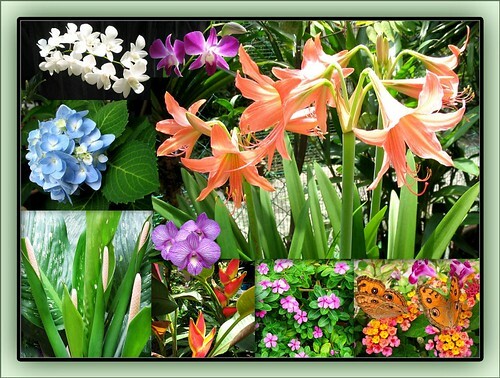 Orange Amaryllis (Hippeastrum hybrid), Dendrobium ‘Sonia’, Dendrobium ‘White Pagoda’, Endless Summer Hydrangea, Dieffenbachia Bowmannii ‘Carriere’, Dendrobium ‘Burana Stripe’, Heliconia stricta ‘Carli’s Sharonii’, Catharanthus Roseus (Periwinkle) and Lantana Camara with Torenia and a couple of Peacock Pansy. These orange Hippeastrum are truly remarkable, deciding to amaze us with 3 flower stalks simultaneously! Hehe…that’s why it received a prominent size in that mosaic! We’re so excited and delighted – this is the first time our potted bulbs produced 3 flower stalks at the same time. Unbelievable, but this is also the third time it’s flowering this year! The other times were in April and June. Previous two years, it produced only one flower stalk and once yearly! I think, this wonderful trio blooming is the result of water deprivation! The Dendrobium orchids are stunners too, especially the ‘White Pagoda’ with its long stalk of 12 flowers. I recently realized that they’re sweetly perfumed too! How lovely! Dieffenbachia bowmannii ‘Carriere’ which first bloomed in March this year, started to bloom again late June! This time it had five inflorescence! And as these gradually wither (2 already down and 3 more to go), I see more buds bursting forth since last week! Incredible, so prolific!